Lately I’ve been watching my “middle age spread” get further and further out of control, so when a few customers at work asked that I prepare a light selection each day I decided to dust off some of the recipes I’ve cooked in the past. 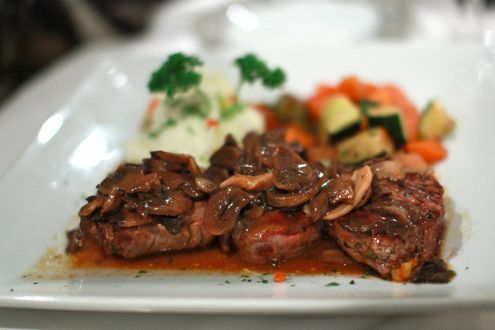 When I was the chef at The Birmingham News, I would offer a regular entree each day and a Weight Watchers entree because so many of the staff were following the plan. That’s where I first tried this delicious soup. I’ll admit the name doesn’t conjure up images in my head of a tasty dish, but this soup is pure delicious. 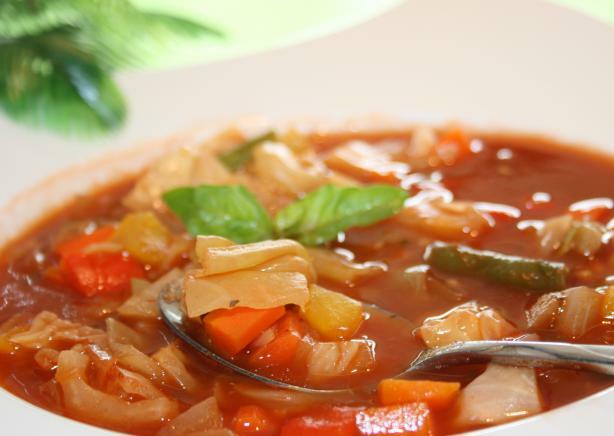 Now my current customers are asking for the recipe so here’s my version of the famous Cabbage Soup (from the Cabbage Soup diet). This is also the same recipe for the ZERO POINTS soup promoted in Weight Watchers. Yes, you can eat all of this soup you want for any meal and have no points added to your daily total. Here’s the easiest part. 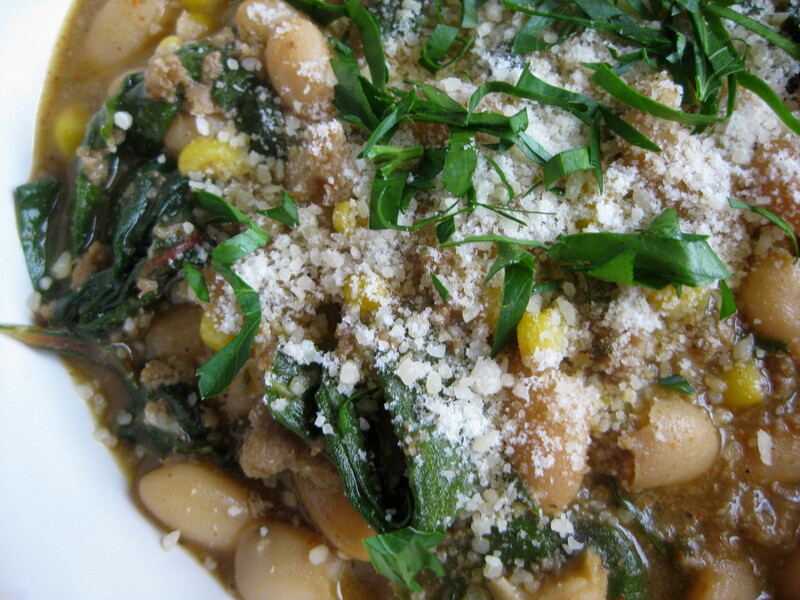 Combine all ingredients in a pot and simmer on the stove 15 minutes. A new year is fast approaching and with every new year I’m reminded of my grandmother requiring us to eat peas (for luck in the new year) and greens (for money). She served her peas and greens as sides to a big country meal. Lately, I’ve been incorporating mine into a one-dish meal so I don’t start the new year off with a dinner loaded with butter, buttermilk, starchy creamed corn, fried pork chops, etc. So as this day before New Year’s Eve draws to a close, I’m about to drag out my faithful Le Creuset covered dutch oven (mine’s not fancy, I bought it at the thrift store) and soak the peas overnight. If you don’t have time to soak the peas, use the trick I use at work. Bring water to a boil on the stove over high heat. Pour in the peas and boil rapidly for about 10 minutes. Pour through a colander and rinse peas well. Then add back to the pot and proceed with the recipe. This works for any type of dried bean or pea but you may have to cook the dish a little longer than the recipe says to get your peas nice and tender. If time allows, put rinsed peas in a stock pot and cover with water (allow about 2″ above the peas). Cover pot and refrigerate overnight. If you don’t have time, look at my hint above, or you can use canned peas. In a heavy stock pot or dutch oven, heat canola oil to medium high temperature. Add the onions and saute until tender and translucent, about 4-5 minutes, stirring often. Add the celery, garlic and carrot and saute for 2-3 minutes more, until garlic is fragrant but not browned. 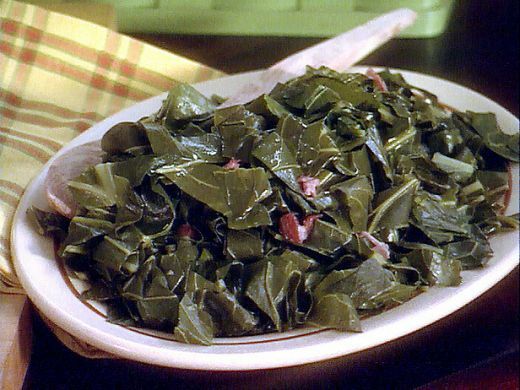 To the vegetables, add the peas, chicken broth, ham bone or hock, thyme, bay leaves, collards and the diced ham. Cook over medium heat, partially covered, for 45 minutes to 1 hour, or until the peas are tender. Once the peas are tender, remove the ham bone or hock and the bay leaves. Get any meat left on the bone or hock and return it to the pot of soup. With a large spoon, mash some of the peas against the side of the pot (I usually mash about 1/3 of them) and this will develop a creamy texture to your soup and thicken it slightly. Just prior to serving, stir in the cider vinegar. Serve in bowls with a piece of cornbread. If desired, you can serve over cooked white rice for a more filling meal. Serves about 8, or plenty for dinner with leftovers for lunch! There’s a chill in the air tonight and I wanted a pot of chili. Only problem is, I didn’t have the correct ingredients to make a pot, but I did have an assortment of “other” ingredients on hand so I decided to make a white bean chili. The white beans, known as Cannellini beans, are just white (or rather a creamy beige color) kidney beans, sold in the can by many brands (the ones I bought are Bush’s). Some people make a chili like this with chicken or ground turkey but the chicken I had was frozen and no ground turkey in the house. I did however have some chicken Italian sausage I picked up at Target, so that’s how I’m making it tonight. Here’s the recipe in case you want to give this one a try! In a large pot, heat the olive oil. Add the onion and chard stems and saute until tender, add the chopped chard leaves and cook for 3-4 minutes. Pour in the white wine and cook until the liquid is almost evaporated. Add the minced garlic, beans and tomatoes. Add the water and the chicken stock base (or vegetable stock base, both sold in supermarkets on the bouillon cube aisle), then season with the cumin powder. Add the Italian sausage and cook over low heat for 45 minutes. I usually cover the pot but vent the lid so some of the moisture will evaporate and the chili will thicken. At work, I feed about 400 people each day and I try to have as little repetition as possible in my vegetables during the week, so I have to get creative and come up with different, less common recipes. 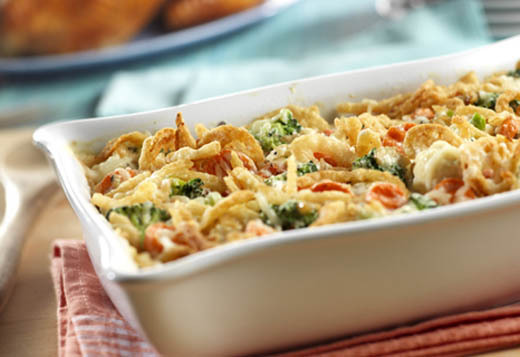 The inspiration for this casserole came from one of my grandmothers, who always made her broccoli casserole with Swiss cheese. 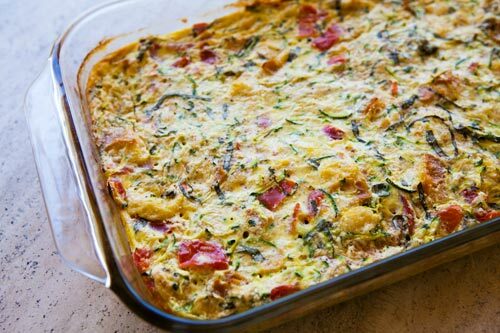 This is more of a “mixed vegetable” casserole. If you don’t have the fresh vegetables on hand, you can substitute 2 bags of California Blend mixed vegetables, available frozen at most supermarkets. That’s where the name of this recipe comes from. California blend is a common foodservice vegetable blend of broccoli, cauliflower and carrots that I’m sure you’ve had, or seen, at catered dinners, luncheons, etc. Usually, the vegetable blended bags contain “less than superior” cuts of vegetables with a lot of stalk and stem, so I try to make this with fresh vegetables whenever I have time to plan ahead. Cook broccoli, cauliflower and carrots in a pot of lightly salted simmering water for 10 minutes or until tender but still colorful. Drain. Add the onions and Swiss cheese to the vegetables. 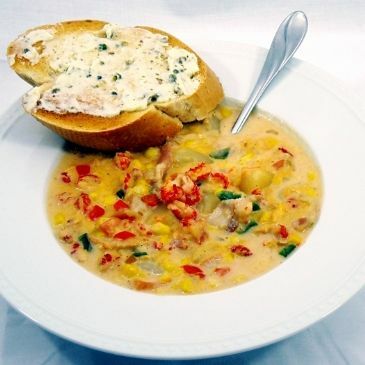 In a large bowl, combine the eggs, flour, soup, milk, melted butter, sour cream, mayonnaise, salt and pepper and mix well. Fold in the vegetables. Spoon mixture into a lightly greased (I spray with PAM) 9″x13″ pyrex baking dish. Bake at 350F for 30 minutes, then sprinkle with the French fried onions and bake 10 minutes more, until casserole is bubbly and onions are browned. Sorry I haven’t posted in a while, but work has been terrible lately and my creativity has been zapped by the time I get home! At the local street market this past week, we picked up some cute little patty pan squash, so for dinner tonight, I decided to stuff and bake them. There are several ways you can stuff squash.. with vegetables, rice, meats, you name it, but since I was cooking these as a side dish, I went easy on the filling. 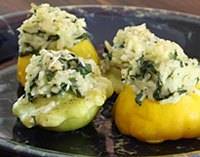 Many people see these squash but have no idea what to do with them, so give this recipe a try if you’ve got some patty pan laying around. 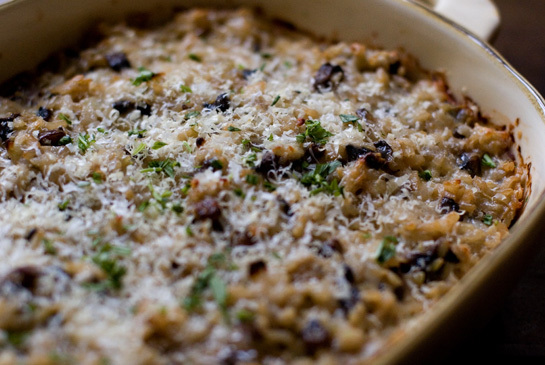 In a small glass baking dish, add 2 tbsp olive oil and set aside. Prep the squash by cutting the top 1/4 off (reserving tops), then using a melon baller, scoop out the flesh, leaving 1/4″ all around. Finely chop the squash centers. In a saute pan, cook the chopped bacon until brown and slightly crisp. To the bacon, add the onion and squash and cook 4-5 minutes, until onion and squash are tender. Add the wine, garlic powder, salt and pepper and cook 1 minute more, deglazing the pan. Pour vegetable mixture into a bowl and add the PANKO, chopped spinach and Asiago cheese. Toss well to combine. Spoon breadcrumb/vegetable mixture evenly into the patty pan squash “cups”. Place the saved tops back on the squash (to keep the stuffing from getting too brown while it bakes). Bake at 375F for 30-40 minutes.